You’ve probably heard the term sustainability thrown around a lot recently. It’s for good reason, we see evidence everywhere that businesses, governments, educational systems, laws, and everything else under the sun has to be able to survive the tests of time. There is no such thing as “too big to fail” just look back in history and we’ve seen Empires collapse under their own weight. At the end of the day, it doesn’t matter how great you think you are, if you aren’t prepared to sustain whatever you are doing it won’t last forever. Knowing that we need to be sustainable and actually functioning in a sustainable fashion are totally different things. It’s time for every individual, business, political party, interest group, etc. to think long and hard about what they are asking for. If you are thinking today that someone else is going to rescue you, think again. At best they will delay the inevitable. A society of individuals that aren’t taught to sustain themselves will fail. Who doesn’t love the idea of a social service? I believe it is part of human nature to want to care for each other. I would even go so far as to argue that life without caring and serving others is probably not life worth living. Sometimes really caring though is asking for the right things, sustainable things, like teaching people that they matter and can stand on their own. Mentoring kids, especially those in difficult situations is one way you can really do this. Never pass up a chance to tell a young person that they can do anything they set their mind to do. We don’t have the luxury of excessive budgets to pay for inefficiencies and blow money on things that don’t work, the party is over and we just got the bill. Today we all have to emphasize the reality that we have to do more with less. With our debt piling up and our social systems strained to a breaking point there is only one real answer to the crisis – doing more with less while also being mindful of what we ask for. 3 Years ago my company leased an entire rack at a co-location facility to the tune of $900 per month. Today I rely on companies that leverage resources in a much more sustainable and efficient way to provide those services. The co-location facility has to do without my business, and so does the staff that is no longer needed to operate it, but in hindsight it would be pointless to place my business in the precarious and un-competitive position to support that co-location facility and the staff to operate it. This could easily be looked at by many as “killing jobs” but if my company goes under I’ll be out there competing for a new one. The old way was not sustainable, the new way is and in the future it is my responsibility to ensure that it stays that way. Human beings have adapted to survive some incredibly challenging environments. We’ve launched successful business ventures during economic crisis’s including the Great Depression. We’ve huddled together to survive unimaginable natural disasters and hardships including horrific wars and genocides. Today you don’t have to look too far to see an incredible amount of energy being exerted, people are angry, they are fed up, many appear desperate and I think many of us are yearning for something I know that I am. What am I yearning for? I yearn most for people to seize the opportunity to work together to solve the problems we face, instead of blaming others for them. What do you yearn most for? I had the great opportunity to get a sneak peek of Chain of Life 2.0 a few weeks ago and several weeks to ponder the impact of it in the San Ramon Valley Community (and beyond for that matter). I was attending some of the afternoon sessions of the Leadership San Ramon Valley “Media Day”. I was present to observe Adriel Hampton‘s talk on Social Media in a political context. I had recommended him and they ended up booking him to be one of the featured speakers. What is Chain of Life 2.0? 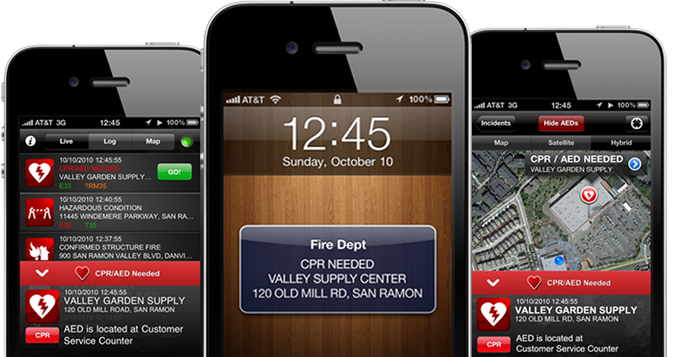 The users of this application will be able to get to heart attack victims even ahead of the traditional first responders (The SRVFPD goal is 7 minutes). This will equate to lives being saved that would otherwise be lost. It is hard to quantify the impact that the loss of a loved one has, but it is great to know that this new breed of application will empower individuals to become heroes for heart attack victims in their community. What does it mean to the San Ramon Valley Community? We can be very proud that perhaps the most significant location aware application was born here. We will be empowered to help our neighbors in ways we never thought possible as the first market in the world to have it. Imagine the feeling that a heart attack victim’s family will have knowing that an initiative born in the San Ramon Valley saved their loved ones life. It is worth mentioning that a Foundation is being formed to bring this open source effort to Fire Districts throughout the US. The end result will mean more people will survive heart attacks which is something we can all be thankful for. You might also want to check out the landing page for the latest on the announcement.